Economists normally study wealth formation and inequality among the adult population, but some people already possess economic resources in early childhood. This column uses data from Denmark to examine childhood wealth and the role of wealth transfers early in life. A main result is that wealth inequality starts as early as childhood. Although overall wealth levels in childhood are low, they are better predictors of wealth in adulthood than parental wealth. After the publication of Capital in the Twenty-First Century by Thomas Piketty (2014), there has been renewed academic and public interest in the development of wealth inequality, wealth formation across generations, and the role of wealth transfers. In a previous paper, we used information from Danish wealth records to analyse the effects of wealth transfers at the time of parents’ death (i.e. bequests) on the wealth distribution of the next generation (Boserup et al. 2016a). This column describes the results of our recent research, where we zoom in on childhood wealth and the role of wealth transfers early in life (Boserup et al. 2016b). Why is early childhood wealth of interest? Naturally, it is related to parental giving, and our prior assumption was that it is likely to reveal information that is relevant for understanding intergenerational mobility and wealth distribution later in life. More specifically, the questions we address are: Are childhood wealth and wealth inequality quantitatively important? What are the sources of childhood wealth? To what extent is the size of childhood wealth related to parental wealth? And does childhood wealth predict adulthood riches, and if so, why? 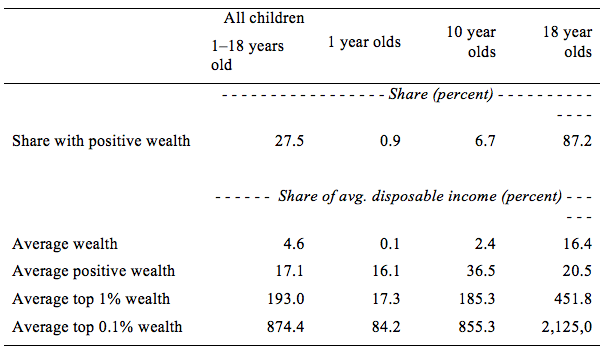 The overall wealth level of children is small, as shown in Table 1. The average wealth level of a child in Denmark (i.e. all persons under 18 years old) is around 5% of average disposable income – average disposable income was approximately 200,000 Danish krone (DKK) in 2011, corresponding to €27,650 or US$35,650 in 2010 – and 63% do not own any wealth. Fewer than 1% of one-year olds own any assets, and the wealth levels are small. The share of individuals with positive wealth and their wealth levels increase over the life cycle of children. When moving into adulthood, nearly all children own some assets, although the average wealth level is still modest at about 16% of average disposable income. However, the average wealth of the top 1% group (0.1% group) is five (20) times average disposable income, so a few children have considerable amounts of wealth when moving into adulthood. Notes: Pooled information for the years 2000-2011. The sample contains for each year all Danes in the mentioned age groups, where both parents are alive in a given year. All wealth levels are converted to 2011 DKK prices using the GDP deflator. Average disposable income was approximately DKK 200,000 in 2011. We cannot directly observe the sources of childhood wealth, but when children are under 13 years old, we can deduce that their wealth stems entirely from transfer payments because it is illegal for them to work. Our empirical results indicate that bequests from grandparents are not the main driving force, but we have circumstantial evidence of direct inter vivos giving – there is bunching at kinks in the tax schedule for gifts, pointing to inter vivos wealth transfers from parents or other relatives. After turning 13, children may work, but we show that at least half of overall wealth when moving into adulthood at age 18 is rooted in previous wealth transfers, and for the top 1% (top 0.1%), at least 92% (99%) of their wealth stems from transfers received during childhood. We find a strong positive relationship between parental wealth and children’s wealth that starts already when children are one year old. Among parents who are not in the top 20% wealth group within their cohort, only around 0.5-1% of their one-year-old children own any assets. This is in contrast to the 5% asset ownership rate for children of parents who belong to the top 1% wealth group. 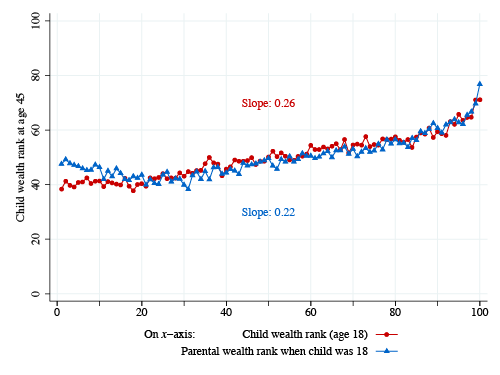 When children are 18 years old, we find an almost linear relationship between the percentile wealth rank of children and parents in their age-specific wealth distributions with a rank correlation of 0.39. The likelihood that the child is in the top 1% group of its cohort is 15 times higher if the parents are in the top 1% group of their cohort. Does childhood wealth predict wealth in adulthood? Needless to say, though, while a rank correlation of 0.39 indicates a strong relationship, it is nowhere close to a deterministic effect, and thus it reveals at the same time significant heterogeneity in parental transfer behaviour conditional on wealth. Is it parental wealth that is important, or is it parental characteristics that can be captured by parental giving that are of relevance? We investigate this further. Our most striking results is that childhood wealth is a very strong predictor of wealth in adulthood nearly three decades later. The figure below displays a non-parametric relationship between the position of children in the (age-specific) wealth distribution observed when they enter into adulthood at age 18, and when they are 45 years old (red curve), and a corresponding relationship between the parental wealth position when the child is 18 years old and the future position of the child at age 45 (blue curve). For example, the diagram shows that children in the bottom wealth percentile at age 18 on average will be in percentile 38 when they are 45 years old, whereas children who start out in the top percentile will on average reach percentile 71 at age 45. The diagram reveals an almost linear relationship between the positions of a child in the wealth distribution observed nearly 30 years apart, with an overall rank correlation of 0.26. Being 10 percentiles higher in the wealth distribution at age 18 implies that on average you will be 2.6 percentiles higher at age 45. Thus, wealth inequality in adult life is strongly related to wealth inequality already in childhood. Notes: The figure plots for the birth cohort of 1965 the average child wealth rank at age 45 (in 2010), conditional on either parental wealth rank or child’s wealth rank (both measured when child was 18 in 1983). All ranks are computed within child age- and year-specific wealth distributions. By comparing the red and blue curve, we also see that the wealth position in childhood works better at predicting the future position in the wealth distribution than using the wealth position of the parents (rank correlation of 0.22). This is also confirmed if we include both factors at the same time in a multiple regression analysis. Both factors turn out to be important, but the correlation with childhood wealth is stronger than the correlation with parental wealth – we find that a 10 percentile increase in childhood wealth position is associated with a 2.1 percentile increase in adulthood, whereas a 10 percentile increase in parental position is associated with only a 1.5 percentile increase in adulthood. Why is childhood wealth a strong predictor of wealth in adulthood? It is difficult to identify empirically the main reasons why childhood wealth is such a strong predictor of wealth in adulthood. One reason could be that transfers received in childhood are so large and differ so much across individuals that they can accumulate into significant wealth and wealth inequality in adulthood. Our analysis rejects this hypothesis. Another hypothesis is that a high childhood wealth level is a proxy for a high level of future earnings that generate a high level of future wealth. Our evidence indicates only a limited role for such a mechanism operating through human capital formation. We find evidence indicating that transmission of savings and investment behaviour from parents to children may have a role to play, and also that transfers during childhood predict future transfers from parents (in the analysis identified by bequests from parents). Childhood wealth predominantly reflects the decisions of parents rather than children. Our work indicates that childhood wealth is not hugely important in its own right, but instead it is a very informative proxy for a broader set of parental characteristics that are not well captured in parental variables alone but are relevant for future outcomes of the child. It would be very interesting to disentangle the extent to which it signals future transfer behaviour of the parents versus future behaviour of the child and, hopefully, future work will be able to do this. In the meantime, we note that its relevance indicates that there is important heterogeneity in parental behaviour conditional on parental wealth, which has a quantitatively large impact on future wellbeing of their children. Boserup, S H, W Kopczuk, and C T Kreiner (2016a), “The Role of Bequests in Shaping Wealth Inequality: Evidence from Danish Wealth Records”, American Economic Review: Papers and Proceedings. 106 (5), 656-61. Boserup, S H, W Kopczuk, and C T Kreiner (2016b), “Born with a silver spoon? Danish evidence on wealth inequality in childhood”, Economic Journal, forthcoming. Piketty, T (2014), Capital in the Twenty-First Century, Harvard University Press.